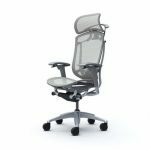 Executive Office Chair Xten was designed to be the world's most beautiful office chair. 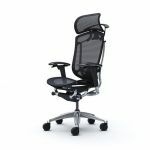 Office chair Xten is available in the polished or in the anthracite varnished version. Xten in its varnished version is an elegant alternative to the polished version, and fits in beautifully in offices having a softer interior design. The varnished version has the base and armrests in anthracite color. - Seat with Technogel® for armchair with high backrest. - Adjustable headrest and lumbar support. - Adjustable arms in polished aluminium or in antracite painted aluminium. 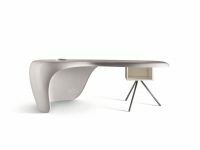 - Polished aluminium or antracite painted aluminium base. - Arms with polyurethane pads. - Self braking castors for hard floor. The current Glamour colors of the aluminium backrest make Xten stand out from all other chairs offered in the marketplace : X101 Red, X102 Metallic Blue, X103 Anthracite, X104 Metallic Grey.